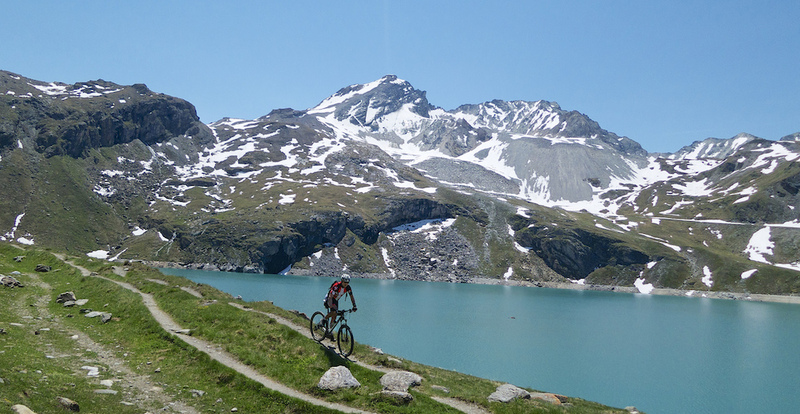 Here is an unbelievable and little known route that gets higher than any paved road in France and visits several beautiful high alpine lakes. 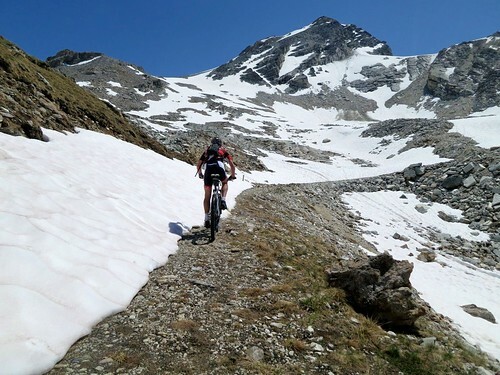 To reach the Col may require snow walking .... even in July. 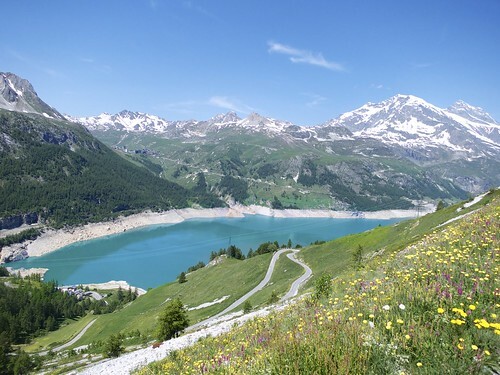 Above: Lac de la Sassière (2460 metres). 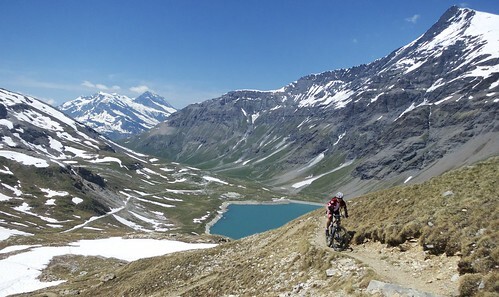 We were in Val d’Isère for Sunday’s Col de l’Iseran “bike-only” day and I decided to spend Saturday exploring up high and off-the-beaten-track. Here is an unbelievable and little known route. I started on a tiny easy-to-miss turn-off in the middle of several tunnels beside Lac du Chevril. Just below Tignes and just before the entrance to Val d’Isère (see map below). 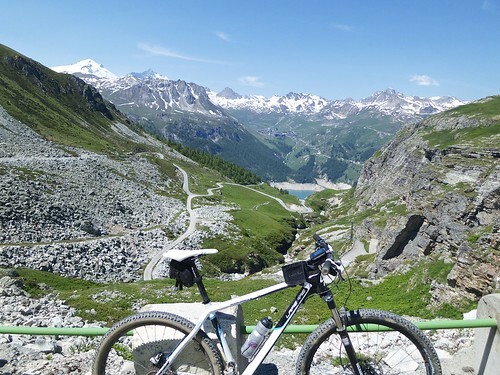 Only the first 5.5 kilometres are paved, but even this is worth it for road cyclists as the route hairpins high above Lac du Chevril – beautiful. I had my 29er and continued on a good quality unpaved road in a high plateau valley with huge mountains on the left marking the border with Italy. I could see a dam from a couple of kilometres away, and as I approached I hoped that Lac de la Sassière would be “full” and it was. It’s a stunning environment – huge mountains everywhere. I was already quite high as I explored along the side of the lake (2460 metres), but I could clearly see a path climbing up the side of the mountain on the other side. Very tempting. High above Lac du Santel, at about 2800 metres I had to leave the bike behind as the snow got deeper and I only saw footprints on a steeply pitching stretch. It was clearly too steep to ride over the top, not to mention too much snow, so I wasn’t too sad that the bike was half a km behind me. This was a series of great rides. First the 5.5 kilometre paved stretch, then up to Lac de la Sassière, and finally the unexpected extension up to Col de la Bailletta. Highly recommended. Nice site, thanks for sharing your experiences with us. 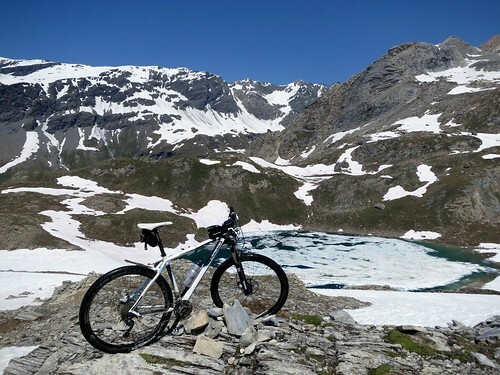 I’ll be in Morzine for the PPDS at the end of June but usually try to get a road ride in as well. Any recommendations for a 50ish mile loop within an hour’s drive of Morzine? If I bring my CX bike I could mix road and gravel maybe? No need to drive anywhere for good road biking from Morzine. 100 kms and 4 primary climbs/cols: Col de Joux Plane, Col de la Ramaz, Col de Joux Verte, and Col de l’Encrenaz. Note: if it is a little more climbing than you are looking for, you can easily cut any of the above climbs out and still make a loop. If not clear from the map in the link just drop me a line. 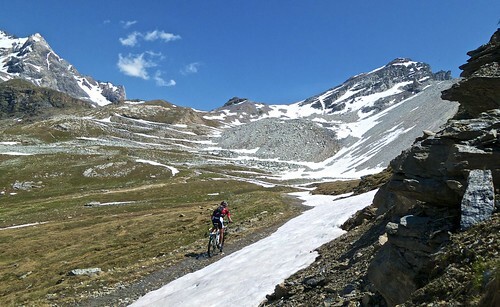 Lots of possible mountain bike rides in area too. 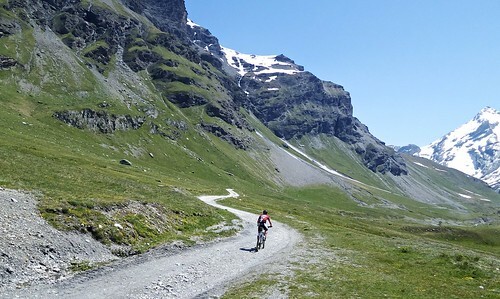 And while I never do it, Morzine is quite popular in summer with mountain bikers taking their bikes up the ski lifts and riding down prepared trails. 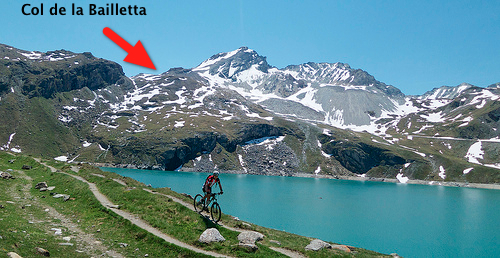 I’ve cycled up the paved bit by road bike before, and hiked up to the col too – absolutely beautiful area. Going back this year – any idea what the deal is with swimming in the lake, reckon it’s allowed/safe? Glad to find your site today, enjoying the photos in particular!